Tread of the Dead is another Zombie based game for iOS devices. This game is developed by Spencer Cordes gaming firm for iDevices. This game is tilt based zombie game in which you will have to navigate different weapons like chainsaws, machetes, ninja stars and all towards approaching hordes of zombies to kill them. Well if you are not a fan of tilt based games then you might not like it. But we think Tread of the Dead is a cool game with tilt based controlling features. Graphics of this game are not eally that great because of classic retro style. We recently reviewd a game with 16 bit retro style graphics called Random Heroes action game. Well you can also change the sensitivity of the game. There are many types of weapons to use against hordes of zombies in the game. Your main job in the game will be to use tilt motion of your iDevice and kill the zombies to finish the levels. In other games you find killing enemies using different weapons. But in this game you will have to use few weapons to get better scores. Some of the weapons of this game have special abilities like Ninja star that splits into 3 parts to kill multiple zombies at the single time. – Graphics of this game are simple in classic style. 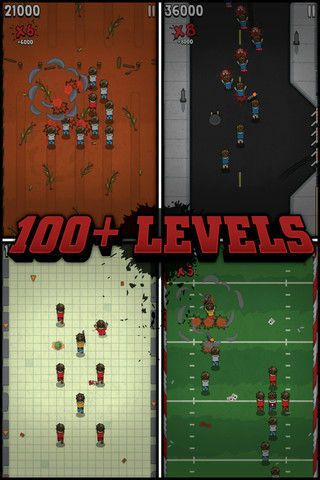 – There are 100 challenging levels are there in the game. – There are 5 modes in the game to enjoy. – There are different types of weapons in the game with special abilities. – It is an universal application and allows you to fight with different bosses.